(1870s, 1880s & 1890s) "Saddle Seat"
High Back Riding/Mounted Trousers for the 1870s through the 1890s, "Saddle Seat" by Frontier Classics. These pants have button fly front, two (2) front pockets and no rear pocket. 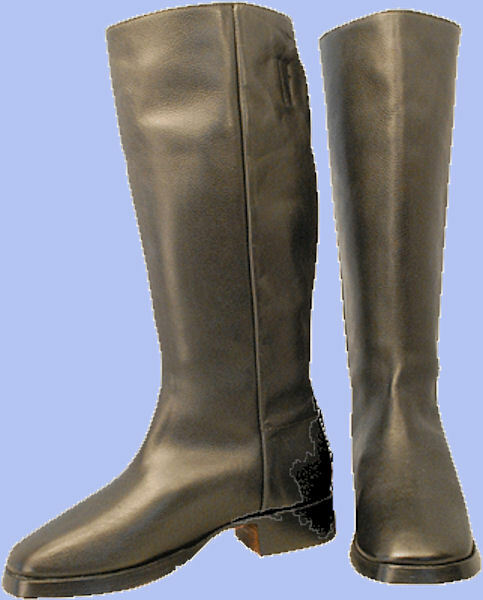 They are reinforced on the inside of the legs like the Cavalry trousers. 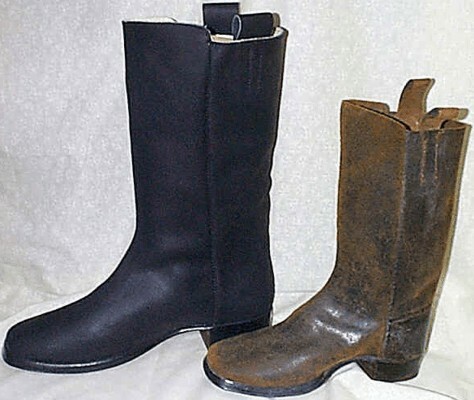 They are especially good for " Old West" 1870s - 1890s impressions. 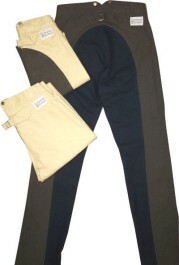 They are civilian trousers, but can be used as "civilian pant" for military field use (they are NOT military issue pants). Period trousers also have a 1" higher rise than today's pants and should be worn loose. Standard inseam is 36", but you can re-hem them as needed. 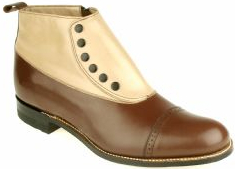 They come in: Wheat/Brown, Brown/Black, Wheat/Wheat or Sky Blue/Sky Blue. 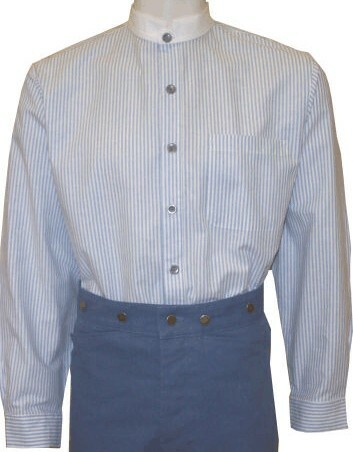 NOTE: These ARE NOT authentic Cavalry Trousers, EVEN in Sky Blue. 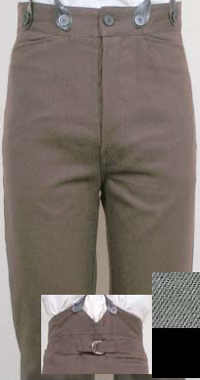 They are CIVILIAN TROUSERS that are ONLY SIMILAR in construction to the Cavalry Trousers. Canvas Duck *** "Saddle Seat"
High Back Trousers for the mid 1880s and the 1890s, the "Prospector" by Frontier Classics. These pants have button fly front, two (2) front pockets and one (1) rear pocket. They are especially good for " Old West" 1880s - 1890s impressions. Period trousers also have a 1" higher rise than today's pants and should be worn loose. Standard inseam is 36", but you can re-hem them as needed. They come in: Blue with Tan Pinstripe. 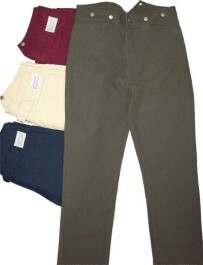 These pants match the "Prospector" Vest, in color and material. Prospector is ONLY a name given to these pants, they are not pant ONLY for prospectors. This type of pant would / could be used by anyone. For mounted us, check out the High Back Saddle Seat trousers. 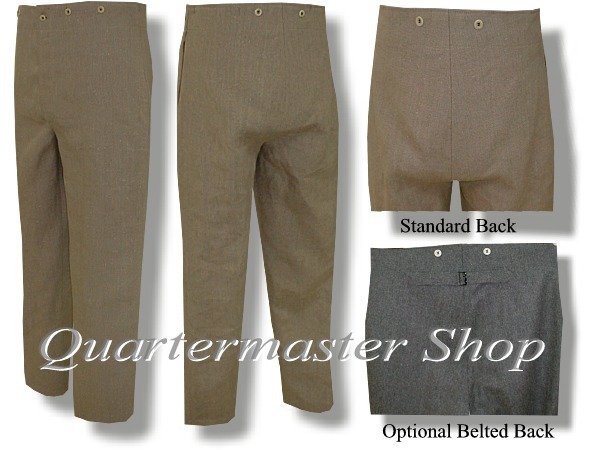 High Back Trousers for the Mid-1880s through the 1890s, "Gunfighter" by Frontier Classics. These pants are 100% cotton brushed twill with front slash pockets, a watch pocket, a single back pocket, suspender buttons and V-notch back waistband. Dry clean only. 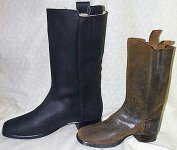 They are especially good for " Old West" 1870s - 1890s impressions. They are civilian trousers, but can be used as "civilian pant" military field use (they are NOT military issue pants). Period trousers also have a 1" higher rise than today's pants and should be worn loose. Standard inseam is 36", but you can re-hem them as needed. Colors: Black, Brown or Gray. 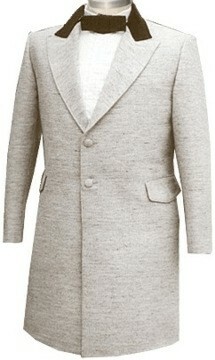 Matching	Coat and Vests are also available, that match in color and material. Gunfighter is ONLY a name given to these pants, they are not pant ONLY for gunfighters. This type of pant would / could be used by anyone. For mounted us, check out the High Back Saddle Seat trousers. Brushed Cotton Twill *** "Gunfighter"
High Back Trousers for the mid 1880s and the 1890s, the "Frontier" by Frontier Classics. These pants have button fly front, two (2) front pockets and one (1) rear pocket. 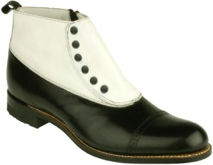 They are especially good for " Old West" 1880s - 1890s impressions. They are civilian trousers, but can be used as "civilian pant" for military field use (they are NOT military issue pants). Period trousers also have a 1" higher rise than today's pants and should be worn loose. Standard inseam is 36", but you can re-hem them as needed. 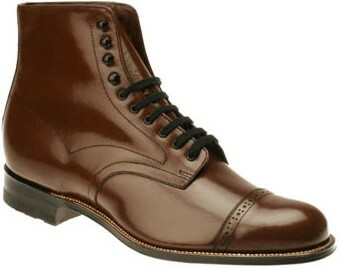 They come in: Wheat, Black, Brown or Crimson. 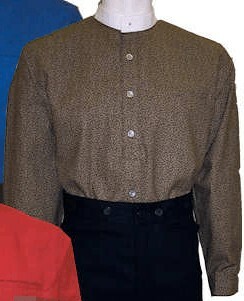 These pants match the "Old West" Double Breasted Shawl Collar Vest, in color and material. Frontier is ONLY a name given to these pants, they are not pant ONLY for the frontier. This type of pant would / could be used by anyone. For mounted us, check out the High Back Saddle Seat trousers. Our 1858 - 1889 Civilian style trousers feature a slightly different cut than the military trousers and different wools and fabrics are used. They come standard with side seam pockets. Mule Ear Pockets are available as an extra cost item. A right hand waistline watch pocket can be added as an option. Civilian trousers make an excellent Confederate Late War impression also. Usually in a civilian outfit (but not always), the vest and trousers will be made of the same wool, while the coat is a harmonizing color. 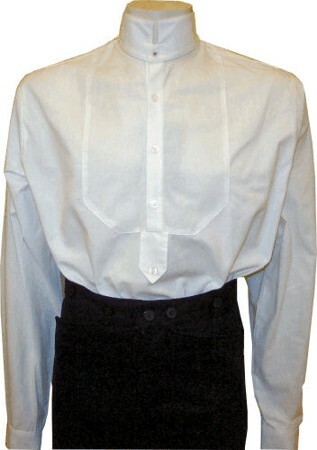 Pewter buttons for fly and suspenders are supplied, but not sewn on. 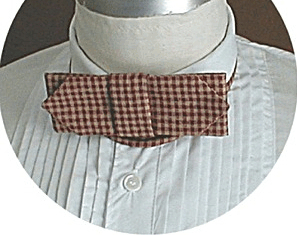 ONE front suspender button per side is standard. 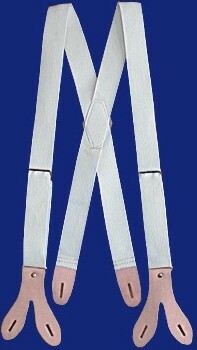 Select two front suspender buttons per side if desired. Period trousers also have a 1" higher rise than today's blue jeans and should be worn quite loose. The legs are left un-hemmed so that you can hem them the length that you want. 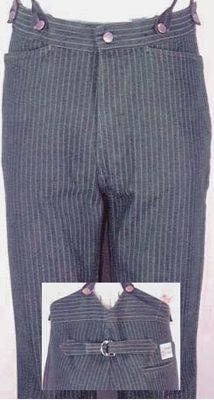 The 1890's Trousers were cut in the "peg top" style, meaning the legs were tapered from the crotch to the ankle. 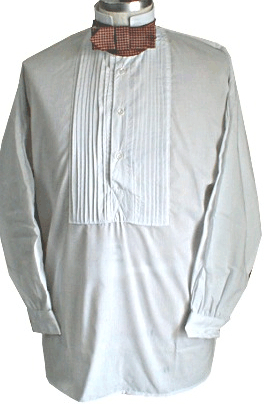 Button fly, side seam front pockets and a single back right hip pocket are standard. 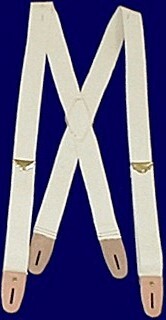 Suspenders are still worn with these trousers, as belt loops were not added to civilian men's trousers until the 1920s. Flat front is standard, with pleated front offered as an option. Also, an adjusting belt may be added to the back of the trousers. 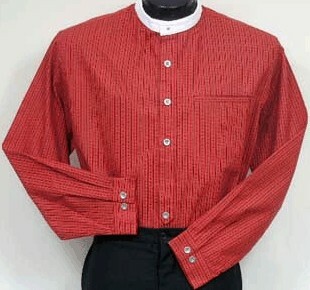 Available in Wool in various colors and several colors of cotton twill, including khaki. 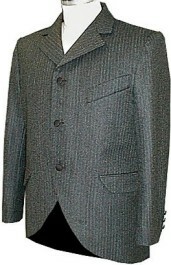 The Grey Stripe Wool material, as shown, is no longer available. 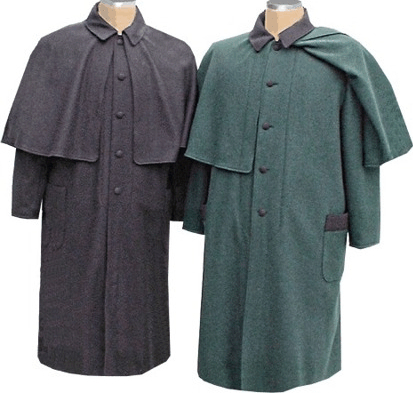 These are good inexpensive coats for the 1860s through the turn of the 1900s. They are not as dressy as the wool coat and are not as tailored, but they work well for images / times you don't want to be as dressed up. Matching Vests are also available for these coats. 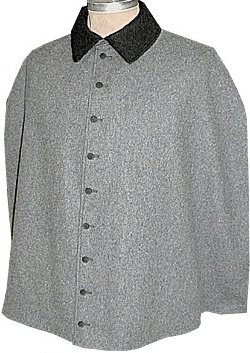 Gunfighter Coat: 100% cotton brushed twill mid-thigh length frock coat with single vent and two flap pockets, by Frontier Classics. Dry clean only. 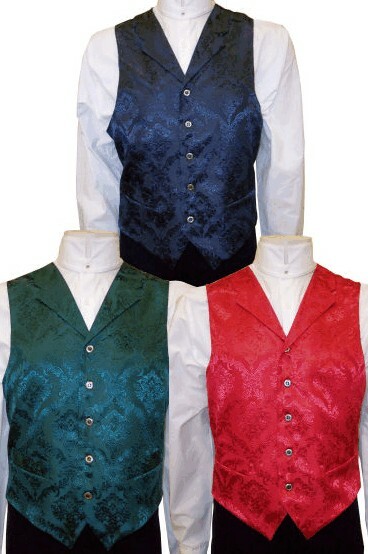 Matching Pants and Vests are also available, they match in color and material. Colors: Black, Gray or Brown. Gunfighter is ONLY a name given to this coat, it is not a coat ONLY for gunfighters. 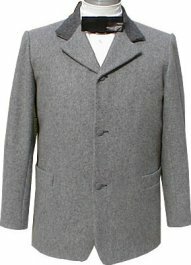 This type of coat would / could be used by anyone. 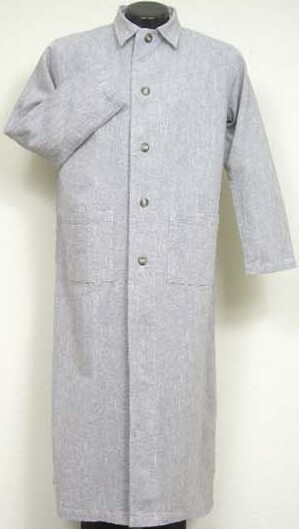 Dakota Coat: 60% cotton/ 40% linen mid-thigh length frock coat with single vent and two flap pockets, by Frontier Classics. Dry clean only. 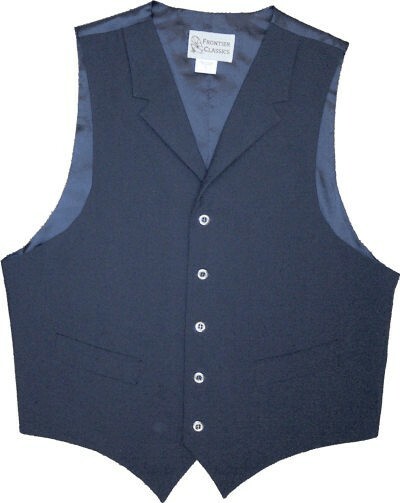 Matching Vests are also available, that matches in color and material. Sorry, matching pants ARE NOT available use the Gunfighter or High Back pants. Colors: available only in color Natural. Note: These coats run large, especially in the larger sizes. One customer who is a 49 chest had a 46R fit perfectly. These are imported and imported clothing does have problems with sizing. If you receive a coat that doesn't fit, you can return it for a different size. This coat first appeared about 1816. Probably of military origin. Body was always fitted, skirts hung strait down from waist center front. First worn as undress, but by 1850 used for formal wear when it replaced the Tails Coat as the dress coat. 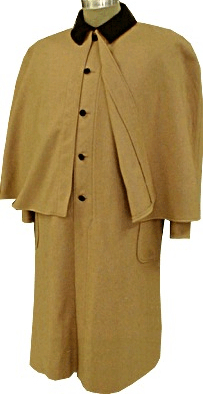 The versatile Full Front Frockcoat comes with a standard length skirt. Skirt can be made shorter for less formal occasions. 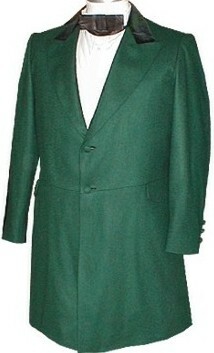 Coat can be ordered with matching collar or velvet can be used in a harmonizing color scheme to the collar alone or to both the collar and cuffs (as shown). It has an inside left breast pocket and two exterior pockets can be added at the waistline for a dashing effect, especially if the velvet trim is ordered. Cloth covered buttons are supplied, but not sewn on. Proper shirt for this coat is the Pleated Front Dress Shirt for dress occasions and the Bleached White Muslin shirt for everyday use. 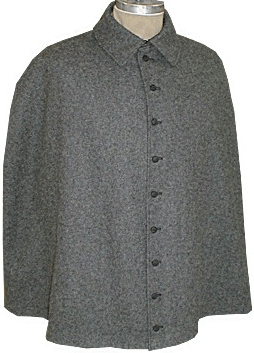 The Full Front Frockcoat was the "dressed up" coat for the common man, while the well-to-do gentleman would have worn this as his "everyday" coat. It is best to suit the elegance of the clothing to the impression that you wish to portray. Our civilian frockcoat is made from quality lighter weight woolens than our military frockcoat. 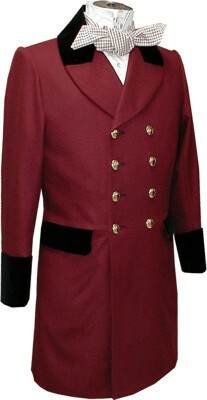 Need a Vest, Pants, Shirt or Cravat to go with this coat? Click here to go to a page with all of them on a single page. 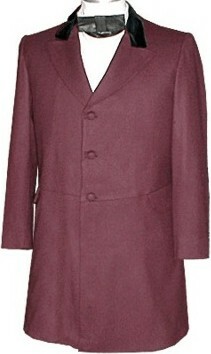 Periods: The style of these coats changed over time, mostly in the collar, sleeve and body fit. 1800/1816-1830: This has the stand and fall collar, it is cut narrower across the shoulders, a smaller sleeve hole, a more of a tubular sleeve and a more tailored body. When made correctly it is much less comfortable than the 1830 and later coats. We currently do not offer this period of coat. If you are interested, call is to talk about it. 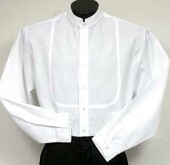 1830-1850 (Dickens and more): This has the rise and fall collar, it is cut narrower across the shoulders, a smaller sleeve hole, a more of a tubular sleeve and a more tailored body. 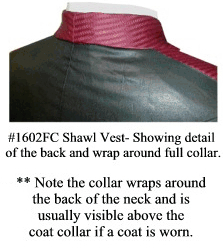 When made correctly it is much less comfortable than the 1850 and later coats. Because most people do not like the true period cut/fit, we modify it somewhat in the body, shoulder and sleeve hole fit to make it more acceptable to modern taste. It is in between the American Civil War fit and the correct earlier fit. 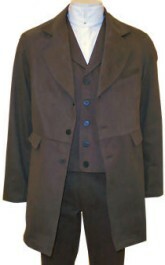 1850 On (Victorian: Civil War / Old West): This is our standard coat. There were style changes to this coat over time, mostly in the collar and lapels. Sometimes there were wide collars and sometimes narrow collars. We cannot cater to the various changes, so we only make the version shown. It has a somewhat wide collar and is most appropriate for 1850 through 1900. The fashionable MORNING COAT (Cutaway) (also known as the Riding Coat) was usually worn for more formal occasions during the morning or early afternoon. It became known as the "Morning Coat" as riding was a popular morning exercise for a gentleman. 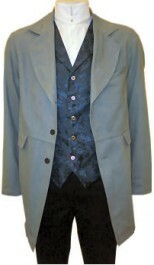 Worn for more informal occasions, eventually taking the place of the Frock Coat. It features the rounded "slope away" front with single button closure and higher waistline. Velvet trim can be added as seen in picture. It has an inside left breast pocket. Front pockets are NOT available on this coat. A cloth covered button is supplied, but not sewn on. Proper shirt for this coat is the Pleated Front Dress Shirt. Our civilian morning frock is made from quality lighter weight woolens than our military frockcoat. 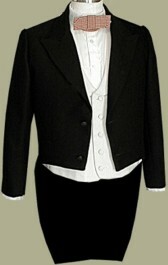 The Tailcoat needs very little introduction. It is probably one of the most impressive coats available. This cut-in tail coat was adopted for all dress occasions and by 1850's was long-bodied and sleek. As early as 1860 it was worn for formal evening dress. 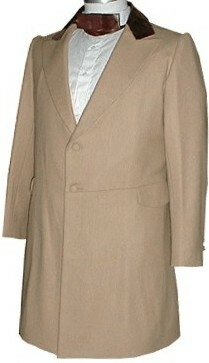 The basic principal of cutting a dress-coat had not changed since 1840, only variations in proportions. This coat is available in either single or double breasted version. 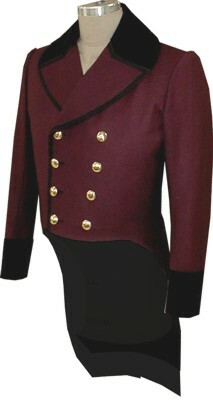 Velvet trim can be added to the collar or collar and cuffs, if desired. 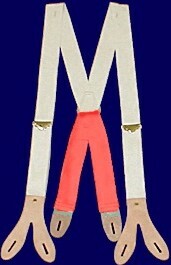 The single breasted version is shown. 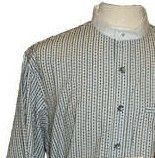 Two cloth covered buttons are close the front and are supplied, but not sewn on. 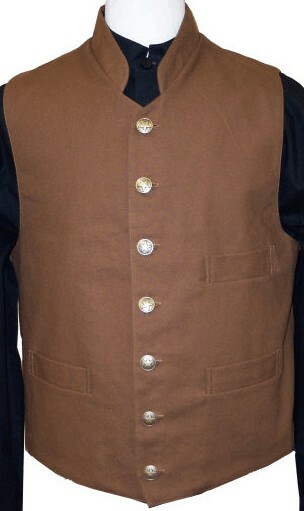 Because of the short waist length of this coat, if one wears a vest it will show at the bottom of the coat front. This is quite normal and is the reason why vests usually matched either the trousers or coat so that the vest would blend in and not create a "scene " at the bottom of the coat. 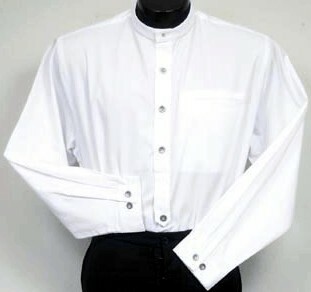 Proper shirt for this coat is the Pleated Front Dress Shirt. Our civilian tails coat is made from quality lighter weight woolens than our military frockcoat. 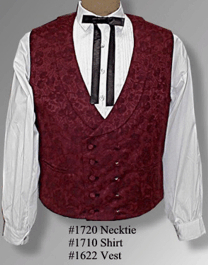 Neckties - Step back into the old West with our 1870- 1885 Necktie! Made of Black Polished cotton and pre-tied with a buckle on the back for size adjustment. We normally have these in stock in all colors. Fits neck sizes from 14" thru 19". 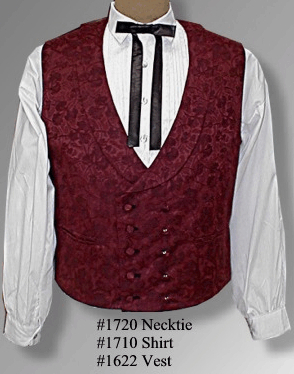 Necktie is shown here with our # 1622 Gambler Vest and #1710 Pleated White Shirt. 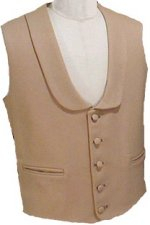 We have a variety of 'Frontier Classics' brand Waistcoats (vests) available in single or double breasted with a variety of collars, bottom cuts and numbers of pockets. 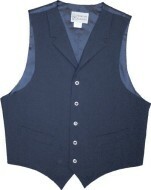 Depending on the specific vest they come in Canvas, Duck, Denim, Cotton/Linen or Poly/Cotton. The Poly/Cotton is the only material offered that is NOT an authentic material. 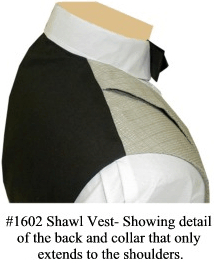 I have not yet researched the actual dates for these vests, which will vary depending especially on the bottom cut, number of pockets and depth of the neck opening. NOTE: The names given to these vests are only names and do not represent who would have worn them. They would / could be used by anyone. 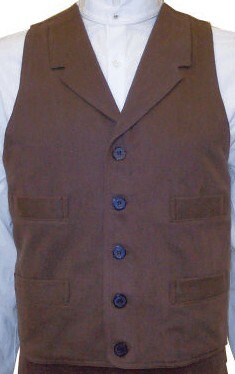 "Old West" Vest (CM59): Double Breasted Shawl Collar vest in canvas with four (4) front pockets. The bottom-front is cut straight across. Available in Black, Dark Brown, Wheat and Crimson. 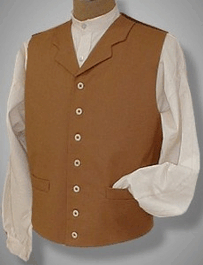 The "Frontier" High Back Trousers match this vest, in color and material. "Frontier" Vest (CM60): Single Breasted Notched Collar vest in canvas duck with four (4) front pockets. The bottom-front is cut straight across. 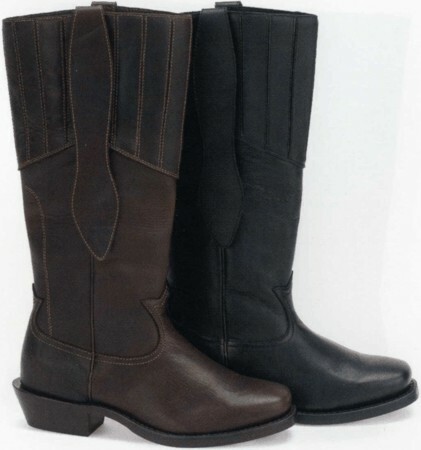 Available in Black, Dark Brown, Wheat and Crimson. 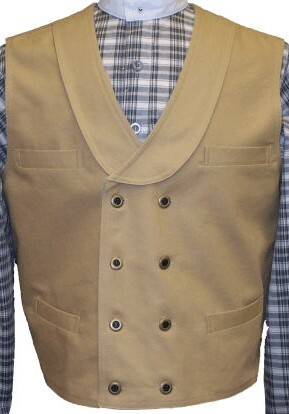 "Scout" Vest (CM61): Single Breasted Military Styled Stand-Up Collar vest in canvas with gold star buttons and three (3) front pockets. Available in Tan ONLY. 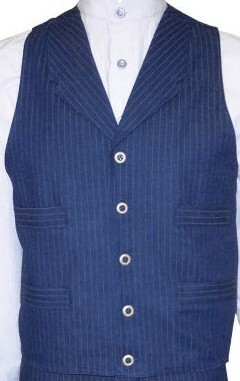 THis vest has been discontinued. We only have: 1 Small, 2 - 2XLs and 1 - 3XL. "Prospector" Vest (CM602): Single Breasted Notched Collar vest in 100% cotton denim with four (4) front pockets. The bottom-front is cut straight across. Available in Blue/Tan Pinstripe. 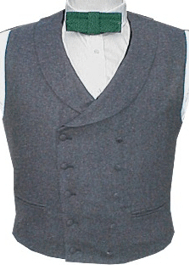 "Gunfighter" Vest (CM604): Single Breasted Notch Collar vest in 100% cotton brushed twill with four (4) front pockets. The bottom-front is cut straight across the front. Available in Black, Gray, Brown. 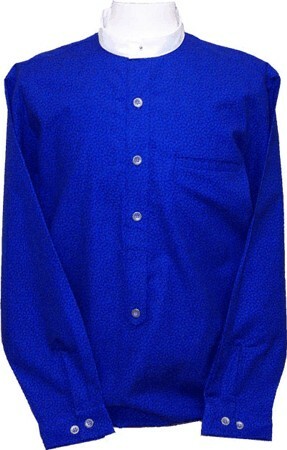 Matching Coat and Pants are also available that match in color and material. 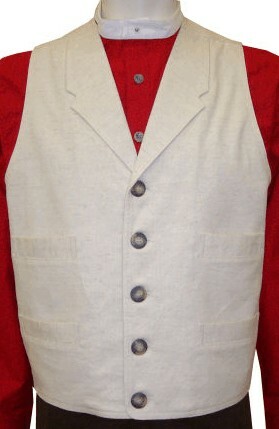 "Dakota" Vest (CM605): Single Breasted Notched Collar vest in 60% cotton/40% linen with four (4) front pockets. The bottom-front is cut straight across the front. Available Natural only. 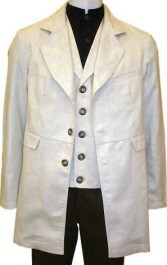 A matching Coat is also available that matches in color and material. 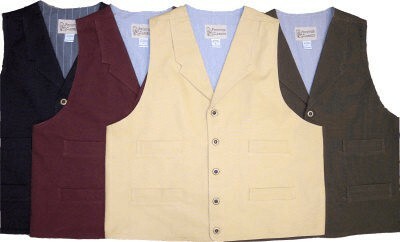 "Bartender" Vest (CM75): Single Breasted Notched Collar vest in solid color Poly/Cotton with satin back and two (2) front pockets. The bottom-front is Double "V" cut across. Available in Black and Navy Blue. "Reno" Vest (CM753): Single Breasted Notched Collar vest in woven jacquard fabric, black satin back and lining, two (2) pockets with a cinch back. The bottom-front is Double "V" cut across. 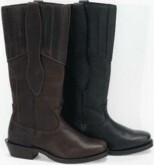 Available in Red, Hunter, Black, Tan. Our CIVILIAN CAPE W/COLLAR, often called a Mantle or Opera Cape. 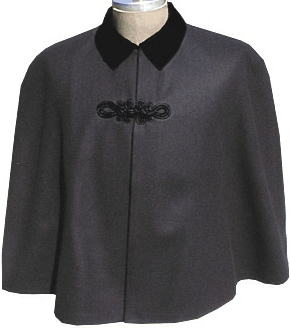 The Standard Cape length extends to the fingertips, longer lengths can be specified at extra cost. It is similar to the mounted style greatcoat cape with lay-down collar. 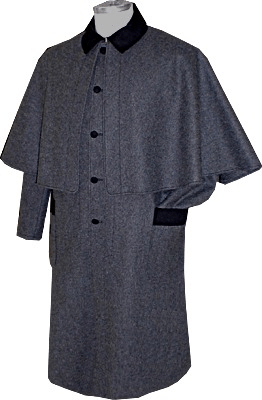 The civilian cape is made from quality Military weight woolens for warmth. 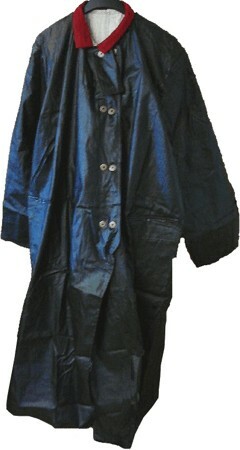 A heavy black cotton lining is standard, with two inside hand size pockets. 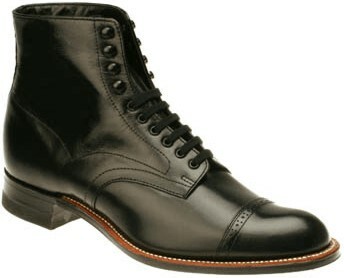 The front is closed by means of a single black "frog" and hook and eye at the collar or with 5, 7 or 9 cloth covered buttons. This garment is a very stunning addition to any civilian impression when worn during the Spring and Fall evenings. 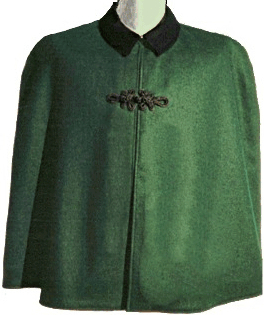 This cape can be used for Civil War as well as much of the rest of the Victorian period. It can be used by Ladies, Gentlemen and Officers.